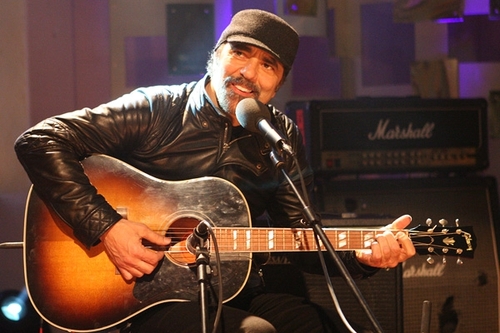 Singer-songwriter and producer Daniel Lanois will appear on a special of The View, tonight on RTÉ One television. Currently working on U2's new album in Dublin and the South of France, the acclaimed Canadian will talk to presenter John Kelly about the influences that have shaped his influential musical career. To watch Daniel Lanois' recent performance on 'Other Voices' click here. Shot on location at The Factory Rehearsal Studios in Dublin, Lanois will discuss his work as a producer for U2, Bob Dylan and Emmylou Harris, as well as his own compositions. He recently made a documentary film about the making of his new album, 'Here is What is', which will have special screenings at the IFI in Dublin on 31 May, and the Town Hall Theatre in Galway on 1 June. The film features guest appearances by U2, Brian Eno, Willie Nelson, Emmylou Harris, Aaron Neville, Sinéad O'Connor and Billy Bob Thornton. Lanois has had a 20-year relationship with U2, which saw him invited by Brian Eno to co-produce 'The Joshua Tree' in 1987. He produced Bob Dylan's 'Oh Mercy' and 'Time out of Mind' albums, which also won a Grammy Award for Album of the Year in 1997. The View Presents… Daniel Lanois will be screened tonight (27 May) at 12am.